Do you remember that scene from the Godfather? The one in which Clemenza teaches Michael how to make a red sauce. "Start with a little oil, and fry some garlic. Add the tomatoes and tomato paste and fry. Add some red wine and sugar." Well I think he'd approve of this sauce. There's no tomato paste, but there is sugar and wine and as an extra special touch, some smoked Canadian bacon that only improves the sauce with age. Which is good, because it makes enough for 1 pound of pasta, or two good-sized spaghetti squashes. More than enough to feed two people for a few days, or the entire family once. I got this idea from a comment Maia left last time I prepared spaghetti squash, and decided I should try pairing this unique little vegetable with some homemade red sauce. Amatriciana is traditionally a pancetta and tomato sauce, and often associated with Rome. 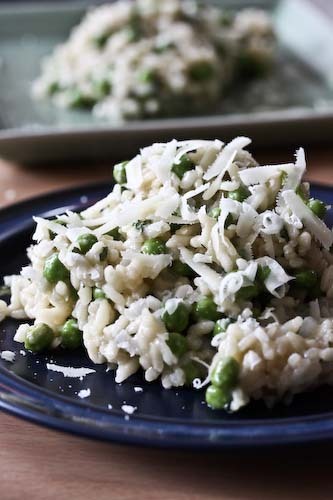 A good grating of Pecorino Romano over the top makes it a true delight. For instructions on baking spaghetti squash, see this post. But really, it's just like baking a potato. Poke a few holes in the skin with a fork and toss it in an oven preheated to 350 for an hour. Be sure to cut it in half once its out so it doesn't continue to cook. Draining is also important so it doesn't give off all of its juices in the sauce. Heat the oil in a 10" skillet and sauté the onions for 10 minutes. Add the bacon and garlic and continue to cook for another 5. Stir in the tomatoes, sugar and wine. Break the tomatoes up a bit with your spoon, and season to taste with salt and pepper. Simmer, uncovered, for 45 minutes. Give it an occasional stir. 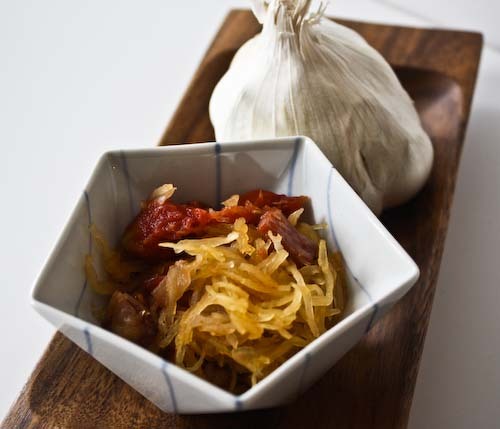 Toss with roasted spaghetti squash or with pasta (it's often served with bucatini). This looks great and the sauce sounds so tasty. I have never cooked with spaghetti squash before, so I am bookmarking this. Andrea, you put up the before pic of the spaghetti squash for me! Thanks! And you are right - they are pretty unremarkable looking! Great idea teaming it with pasta sauce, now I just have to try and find spaghetti squash in Sydney! 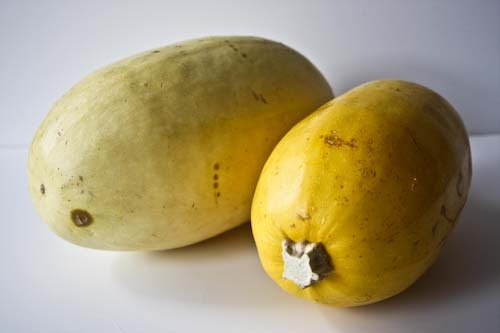 Esi, I think you'll be pleasantly surprised by spaghetti squash. It's really such a strange little veggie! Hanne, papers are all done! This was the first time I've had it with red sauce, but I'm a believer now. Annie, I did put those pictures up for you! Not that they're ugly, but they're not amazing looking, either. Spaghetti squash are very common here in the US, but I guess not as common outside. Good luck! I've never seen a spaghetti squash for sale here, we can get the seeds though. Maybe I'll try growing it next year, it looks really interesting!